Diagnosed with ALS, a fatal neurodegenerative disease, film-maker Ben Byer starts documenting his life. What begins as a video diary grows into an epic and inspirational 3 year journey as Ben scours the globe looking for answers and a cure. A film of towering beauty and deep philosophical insight, Indestructible transcends its dark subject matter to deliver a universal message about the tragic joy of being alive. "I want to make a movie. That's my goal, man. Like, what's one of the twists of fate in your life that you would have just never imagined?" A youthful Ben talks animatedly into the camera ten years before his diagnosis. In the bewildering early stages of his illness, Ben can't hide his fear: "I'm having a hard time typing, my hands are not working...I could have any number of things". But when Ben receives the devastating diagnosis he is no less in the dark. "They have more treatment for the flu than they do for ALS", he quips. The most doctors can do is monitor the gradual deterioration of all of his muscles. The only certainty: "patients do not live past six years". "This is a hard disease to give advice about", says one of the patients Ben reaches out to, "each person must find it for himself". After hours of research he comes across 'BuNaoGao' a Chinese herbal medicine, which is "not a cure, but an oasis in the desert of ALS". Ben's indomitable spirit is spurred when he notices a slight improvement and he heads to China to meet the creator of BuNaoGao. "My body is about 15% dead', Ben says defiantly, "but I'm also 85% alive". Eastern medicine might have the answer. "Everyone I've talked to with ALS in America, they're not doing too well, they're in wheelchairs", says Todd, a fellow sufferer living in China. Then Ben stumbles across a controversial foetal cell surgery, believed to allow ALS sufferers to run again. "It will get you a new life", says Danny Vyvey. Before the operation he couldn't take a shower on his own. Ben goes ahead with the surgery and his father begins scheduling many ALS patients for Dr Huang. But the surgery doesn't work. Dr Huang comes under increasing criticism from the Western medical establishment and Ben's options have run out. "Probably the thought [of suicide] runs through my head once a day", Ben admits. Yet through the twin passions of his son and his film, Ben somehow comes close to that purpose driving us all: "I wish I was a good enough artist to make this movie without having the disease", he grins through tears. 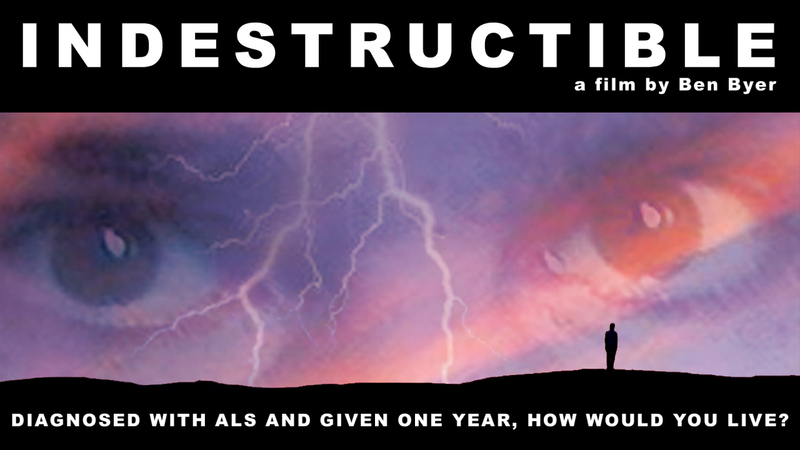 By turns amusing and tragic, 'Indestructible' is one of the most intimate and powerful films you'll see on a degenerative illness. Ben Byer was born in Chicago in 1971. He was diagnosed with ALS in 2002. During the 31 years between these two occasions he has done many things, mostly legal. 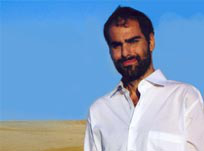 After graduating from Evanston Township High School he studied Journalism at Indiana University and Film Theory at The University of Paris where he made short films on 8mm. A job as a translator at the Cannes Film Festival led him to Hollywood where he worked for a producer of B-movies. Returning to Chicago he took up acting and has since performed on many of that city's notable stages including Steppenwolf Theatre, Organic Theatre, Trap Door Theatre, European Repertory Company, Circle Theatre, Café Voltaire and the Staddschowburg Theatre in Amsterdam. Like all struggling actors he left for Los Angeles and found himself selling beef out of the back of a truck. This unsavory experience inspired him to write his first play, 'Take it Deep', which was produced to much success shortly before being diagnosed with a fatal neurodegenerative disease. Unable to write or perform, Ben turned his attention towards film directing, a vocation more suited to the disabled. In 2003 he co-founded ALS Film Fund with his sister Rebeccah Rush to produce original works of art, whether film, theatre, sculpture or other intended to create positive change for ALS sufferers around the world. Ben Byer died of ALS on July 3, 2008. "Travelling by myself and then with a small crew we filmed the isolated world of ALS; interviewing patients and their families, medical professionals, scientists, religious figures and almost anyone we could find. I wanted to know (perhaps naively), 'What does it all mean?' 'Indestructible' is an attempt to understand and accept the reality of a mysterious and deadly disease that has brought science to its knees, an illness that is a paradigm for lifes ultimate challenges. My personal story in the film, and that of every ALS patient, follows this frightening path into an uncertain future."